Get $25 off your first screen with Verified First! Ask us how you can save! With Verified First background screens you can request authorization, order your background check, and access results directly from the applicant profile page on your iRecruit account. All results adhere to the Fair Credit Reporting Act. 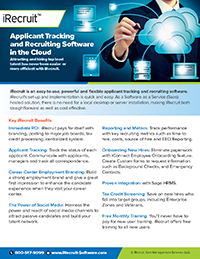 Seamless integration improves your hiring workflow so customers can perform background checks faster, and for less! Get $25 off your first screen with Verified First! Contact us today to start saving! This entry was posted in Blog, iRecruit Blog and tagged background screening, iRecruit, verified first. Bookmark the permalink.